Parents who have just finished buying up big on school and kindergarten supplies will probably agree that the lunchbox purchase is a harrowing ordeal. My children like to pick their own and I’m almost always presented with three flimsy plastic boxes in awkward sizes that look just like every other lunchbox in the class. Enough is enough, we need to think practical. We’ve been huge fans of Dwell Studio for a long time here at Babyology, flaunting many of their gorgeous products for our readers. Well, we’re not about to stop because I have found one of the most delightful and useable lunchboxes yet and, yes you guessed it, it’s from Dwell Studios. 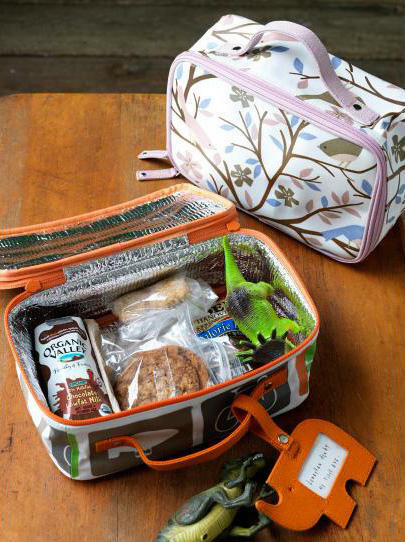 The Dwell Studios lunch bag is big enough to hold all your child’s lunch and snacks from start of school day to finish. It’s insulated to keep things cool and is made from a covered cotton canvas so can wipe clean. There’s a zip enclosure for easy opening and closing for little fingers and of course, it looks awesome in the Dwell design prints we all love! What more could you ask for? I love the Paper Doll Petals design, though I’m not convinced my Master Three will feel the same. You can get yours from Design Child for $49.95, with delivery available all over the country!